Writing is so much fun. If you’re thinking of writing a book, one of the first things you’ll need to do is pick a genre. I picked romance. Out of all the genres out there, why did I pick romance? Plenty of people write romance so there’s a lot of competition out there. Remember what happened at the end of Gone With the Wind? Scarlett lost Rhett and collapsed in tears, but then she decided to go home to Tara where she can think of a way to get Rhett back. Human beings are designed to hope. I also think that romance novels possibly satisfy our craving for justice. In the real world, things don’t always end happily. Children are abused, the missing teen is never found, or we get our heart broken. In the vast majority of romance novels you know the bad guys are going to get what’s coming to them. My heroes and heroines sometimes face determined villains, but you can rest easy in the knowledge that the bad guys will never win. Last, I write romance because I’m a romantic at heart. I just adore a good love story. 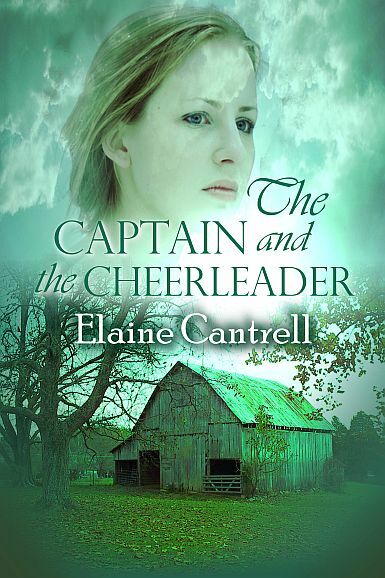 In my latest release The Captain and the Cheerleader my characters have many obstacles to overcome before they find true love. Their romance didn’t start off like you might expect, but don’t worry. Both my hero and heroine are made of good stuff. Heat flared in her eyes and caused him to tighten his hold on her hand. Elaine Cantrell was born and raised in South Carolina where she obtained a master’s degree in personnel services from Clemson University. She is a member of Alpha Delta Kappa, an international honorary society for women educators and Romance Writers of America. Her first novel, A New Leaf, was the 2003 winner of the Timeless Love Contest. When she’s not writing, she enjoys movies, quilting, reading, and collecting vintage Christmas ornaments. I can connect with your characters due to a long career as a secondary teacher. My daughter lives at Clemson and we visit often–another connection. Best wishes! Thanks so much, and that’s a big connection. your new book sounds good too. Cute excerpt. I like your characters already. I write romance for the same reasons. I loved reading your explanation. It was like talking to a friend! The excerpt was great. Thanks, Kara. There’s nothing like a good romance novel! I enjoyed your post! Your reasons for writing romance were well thought out and I love the idea that we find justice in our novels for a world that sometimes lacks justice. We do need that kind of hope in our lives! Thanks for sharing! Oh, and red hot excerpt! I loved your blog on why you write romance. You are a very skilled writer. My stories, too, have happy/satisfying endings. I write for the same reasons: sci-fi romance=hope for the future; romantic suspense & mysteries=justice. Life has so many hardships as you mentioned. I’ve experienced most (not divorce or loss of a spouse). Great excerpt. Best wishes, Elaine.